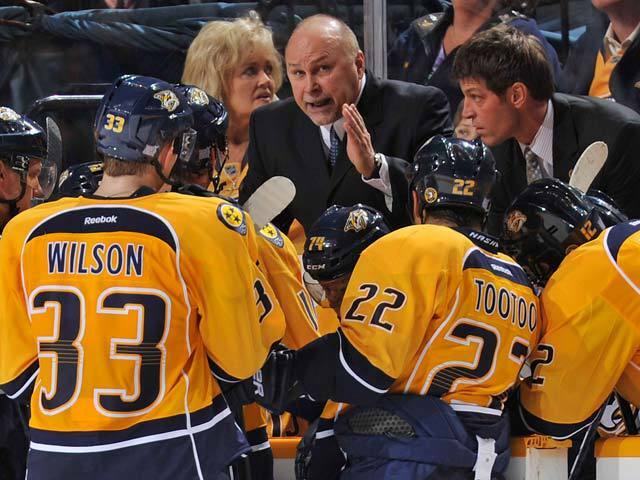 NASHVILLE -- After his playing career ended, Barry Trotz began settling into a life after hockey, but he had not completely cut the cord. He was 22 and acting as an assistant coach at the University of Manitoba, where he had spent his final playing days, and working his way up the corporate ladder at a billion-dollar computer company as a part-timer. It represented the pull of home, but also the opportunity to jump in with both feet into a career in hockey. The Dauphin Kings, a Tier II junior team in Manitoba for which Trotz had once played in his hometown of 8,000, needed a coach and general manager. The club was in debt and was looking for a young person with local ties to hire on the cheap. Jack Adams Award (Coach of the Year) finalist in 2010 and 2011. Trotz is the only NHL coach to lead his team to the postseason in six of the past seven seasons. While five other teams have made the playoffs in six of the past seven seasons, all except Nashville has had more than one head coach while doing so. Those other teams have had a combined 22 coaching changes. 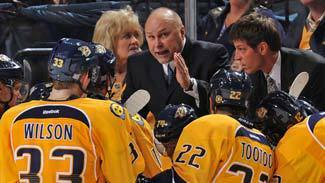 Trotz has the second-longest current NHL coaching tenure; the only NHL coach with his club longer is Lindy Ruff (BUF). Only three men have coached more games with a single franchise. Trotz was torn. He knew he'd have to take a part-time job to make ends meet if he accepted. The solution came from his girlfriend at the time, whom he had first met in the fourth grade when they were both growing up in Dauphin, about four hours northwest of Winnipeg. "She said, 'You love hockey,'" Trotz recalled 26 years later, as he prepares to coach his 1,000th game behind the bench of the Nashville Predators on Saturday. "We're not married. We have no kids or anything. If you're going to do anything, try anything, why not try it now instead of waiting five or six years? You should just do it.'" So he accepted the job, heeding the advice of the girlfriend who later became his wife. "All of my life, my wife's been the rock," Trotz said. "She's made the right decisions." Kim Trotz said she thought the job would be a good way for Barry to reconnect with his parents, as he left home at 14 to play hockey. But she also knew he never wanted his parents to worry about him financially. His father worked as a mechanic on the Canadian National Railroad and his mother as a waitress in a hotel restaurant and as an Avon lady. For a time, he sold suits on the side. "He was more worried about stability than having to worry about making ends meet," Kim Trotz said. The coaching life did not always prove to be salad days for the Trotzes. When Barry accepted a job as an assistant coach with the Baltimore Skipjacks in the American Hockey League, Kim couldn't get a green card for almost four years, and as a result, couldn't legally work, forcing the couple to clip many a coupon with three young kids by that point. However, by persevering, learning the game from the ground up and succeeding, Trotz is poised to enter rarified air as a model of constancy. Only three other coaches in League history have coached 1,000 games with the same team: Al Arbour with the New York Islanders, Billy Reay with the Chicago Blackhawks and Lindy Ruff with the Buffalo Sabres. The last two seasons, the NHL Broadcasters Association has named Trotz a finalist for the Jack Adams Trophy. He and general manager David Poile remain the major reasons why the small-market expansion franchise has navigated ownership issues and payroll limitations in a non-traditional market while becoming one of the League's few to earn playoff berths in six of the last seven seasons. Trotz is greeting the milestone with his customary humility. "I feel like one of those -- they have them in the pro shop where you have the jerseys of all the players -- and all of the sudden they put your name there," he said. "That's what I feel like. Like one of these things don't belong here." It's hard to imagine Trotz starting a junior career at 17 years old while standing just 5-foot-6 and weighing 140 pounds, and then amassing a total of 490 penalty minutes in 204 games over the next few seasons. But the Western Hockey League was a rugged place in the late 1970s and early 1980s. Describing it almost as a lark, Trotz tried out for the Regina St. Pats in 1979, and somewhat to his surprise, stuck. For the first few months he bounced between the St. Pats and the Regina St. Pat Blues, the farm club, which he said forced him to play games almost daily. In Regina, Trotz made connections that would serve him well for a career in hockey. Current Ottawa Senators GM Bryan Murray was the coach of the St. Pats, and his first roommate was Hockey Hall of Famer Al MacInnis, who was a year younger at 16. MacInnis only played two games with the big team that first season, as Trotz said back then the league was filled mostly with 18- and 19-year-olds, with a few overage players mixed in for toughness. Trotz arrived in Regina as an offensive-minded defenseman, but in the Darwinian system of junior hockey, he recognized that he had to evolve -- a characteristic he has maintained to this day behind the bench. "I was just trying to survive and play good defense, so I changed my game," he said. "I was trying to be more of a team guy. For my size, I think I played bigger than my size. I tried to play bigger, which is probably why I got as injured as I did." Trotz said being under-sized taught him a lot about leverage. No matter the opponent, he successfully could employ the can-opener maneuver -- still legal then -- to his advantage. Trotz also said he learned the value of moving the puck quickly to avoid mismatches against opposing forwards. Then there was the team aspect, an element that has been integral to Nashville's approach. The Predators don't play an intimidating or star-laden style -- in fact, they often rank among the NHL's least-penalized squads -- but they don't shy from the physical aspect with bruising players like Jordin Tootoo, Brian McGrattan and captain Shea Weber. "I used to end up fighting a lot of the Sutters," Trotz said. "All of the Sutters -- Richie, Ronnie, Brent. The Mollers (Randy and Mike). We had a good rivalry with Saskatoon … I wasn't the toughest guy on my team. I know that." Trotz's first serious injury came when he was cross-checked into the end boards. He said he thinks he probably suffered a concussion and spent six weeks sleeping on a recliner because he couldn't lie flat. An inner competitiveness -- the kind that would stir a young player to play daily or to fight through injuries -- is another Trotz hallmark. Craig Button's father Jack was the assistant general manager of the Washington Capitals under David Poile from 1982 until he died in 1996. He also is the person most responsible for Trotz's career in pro hockey, and as a Western scout, identified Trotz as a prospect. Craig Button, the former general manager of the Calgary Flames and now an NHL Network analyst, only half jokes that Trotz was his father's favorite son, albeit an adopted one. "He didn't have the skill to advance to the NHL, but he gave everything he had in the game," said Craig Button, who added that one of his father's favorite photos was a celebration following Trotz's 1994 Calder Cup title as coach of the Portland Pirates. "He was committed to helping the team in whatever way. He never came off the ice. … My dad loved that. …The energy, that determination that Barry exhibited, it's the same thing Barry exhibits as a coach, those qualities -- unalterable qualities." The defining story about Trotz and his relationship with Jack Button is the invitation that Button helped the 20-year-old Trotz secure to the Capitals' training camp in 1982. 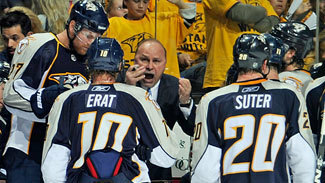 Unbeknownst to him, Trotz was brought in only to help fill out the roster. He had built himself into a muscled 195 pounds in preparation over the summer, hoping to fulfill his dream and land a spot on the Caps' NHL roster. The first day he hit the ice in Hershey, Pa., Trotz sought out Button in the stands to thank him and to let him know that he planned to make the most of it. "He looked at me straight in the eye and said, 'The only reason you're here is you might be a good minor-league leader or a coach someday,'" Trotz said, the disbelief still seeming to hang on the words. Despite the sting, Trotz at least brought back a positive memory. He got to play in a preseason game in Johnstown, Pa., and remembers taking a run at 6-6, 220-pound forward Archie Henderson, later a scout. After the game, Trotz ran into Henderson, who was coming out of the Zamboni door. "I wasn't afraid to do what I had to do." After the initial position with the Dauphin Kings, Trotz received opportunities elsewhere. He became the coach at the University of Manitoba -- as an assistant he had served under Wayne Fleming, who would become a long-time NHL assistant -- and then moved out west to Vancouver. By 1988, Trotz was a full-time Western scout with the Capitals, benefitting from that continuing relationship with Jack Button. In 1991, Washington asked him to move to Baltimore as an assistant with its top farm team. A year later, he was the coach. When the team relocated to Portland, Maine, Trotz went with it and his squads appeared in two Calder Cup finals in four seasons, winning that 1994 title. "Again, now as I look at it after the fact, it's like the perfect resume in terms of grooming an all-round hockey person," Poile said. "He had all the time to groom his thoughts and skills, thoughts of what he would do when he became a coach. "Nobody could outline a development plan any better for a person who is now in Barry's position." In 29 seasons as a general manager, Poile has hired only four coaches. He has fired only two -- Bryan and Terry Murray. In explaining it rather dryly, he said, "I've never been much of a short-term guy in any of my decisions." When the expansion Predators named Poile general manager in 1997, the conventional wisdom was to hire an experienced coach so as to hide as many of the team's weaknesses as possible -- Jacques Lemaire in Minnesota being a quintessential example. Poile elected to buck the trend and tapped Trotz. Hired a year before the team iced its first squad, Trotz used the time to scout. Not just players, but systems. Poile likened it to, "a teacher taking a sabbatical for a year to work on your Master's degree." Both Poile and Trotz say that with expectations low in the organization's first few seasons, they allowed themselves the freedom to experiment. 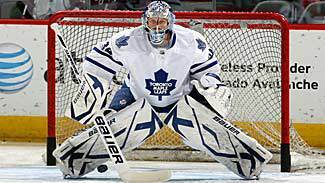 That led to taking a flyer on a player like Kimmo Timonen, who, when Nashville acquired him from Los Angeles in 1998 for future considerations, was considered small and having a European-type game that might not translate to the NHL. "When he came over, I think a guy like Kimmo Timonen opened the door for (Brian) Rafalski and the Dan Boyles of the world," Trotz said. Boyle's breakout season came in 2002-03 and Rafalski entered the NHL a season after Timonen. "Because everybody was going in the mode of 'bigger's better,' and the game was starting to evolve a little bit." Whether it's Timonen, Dam Hamhuis, Marek Zidlicky, Ryan Suter or Weber, Nashville has developed high-end defensemen almost since arriving in the League. Perhaps Trotz's playing career as a small, mobile defenseman with good instincts has something to do with that. In his first season behind the Predators' bench, Trotz admits to being more tightly wound than he is now (long-time Predator David Legwand also quipped that he had more hair and that it was darker). As part of his evolution process -- there's that word again -- Trotz said he communicates more. "Each player individually brings different gifts," he said. "You try to accept them and use them. Not use them, but allow them to use what they're able to use. Not everybody's cut from the same cloth. They can be put into a similar cloth and woven into a similar cloth, but they're all different. "I look at, especially at the NHL level, every player's their own company now. They're their own companies now and they demand more from coaches now. More information -- more coddling, if you will. It's a learning process, too, but players are better than they ever have been, too. It's evolution. Bigger, faster, stronger." One of those bigger, faster, stronger young players is Colin Wilson, the seventh pick of the 2008 NHL Draft. Wilson scored 16 goals last season as a 21-year-old, but down the stretch, Trotz didn't like Wilson's play. How the coach handled the situation provides insight into his style. Trotz sat Wilson the entire first round of the playoffs and for the first three games of the second round. Wilson said the player and coach held meetings almost daily. "There was just a lot of communication," Wilson said. "Letting me know what I was doing wrong, because if you get sat out, but you don't know what you're doing wrong, it's kind of hard to critique that and get that better." Wilson said at first he felt bitter and took the benching personally. Then he came around. "He was telling me, 'How are you doing? You're going to get put back in (the lineup), but just give it some time, but here's what you need to do to get better,'" Wilson said. Wilson regrets missing those playoff games, but says he's an improved player for it. "No complaints here," he said. Barry Trotz is one of just seven coaches in all four major North American sports leagues to have coached or managed each of a team's first 12 seasons of existence. NHL: Lester Patrick (13, N.Y. Rangers). MLB: Connie Mack (50, Philadelphia). 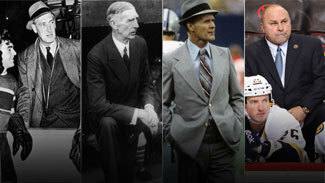 NFL: Curly Lambeau (29, Green Bay), Tom Landry (29, Dallas), Hank Stram (15, Kansas City), Paul Brown (15, Cleveland). Trotz's philosophy embodies a little bit of "the golden rule" while also being guided by just trying "to do what's right." "Not what's popular, just try to do what's right," he said. "And handle people in a way that you want to be handled. It's not always that way. There's times I blow my gasket. One thing I learned is I don't hold any grudges. With longevity, that's what's happened. Players know I'm not after them and it's not personal. "Let me get it off my chest that I don't like the way you're playing. Tomorrow, I'm still going to love you and we're working together." For a coach to spend 14 years living and working in the same city is an eternity in a nomadic profession. In the 10 years from 1987 to 1997, Trotz lived in Winnipeg, Vancouver, Baltimore, Portland and, finally, Nashville. Barry and Kim have four children, and their oldest daughter was in second grade when they moved to Nashville. She's now a senior at the city's Belmont University. Their oldest son is double-majoring in Russian and history about 90 miles to the east at the University of the South. A second daughter attends Brentwood Academy, a local private school, and the youngest is a fifth-grader. Kim Trotz describes the family as having a rich life in Nashville with their church, the community and friends who have become like family. "We never expected to be here that long," she said. "For them (the kids) to have friends from Grade 2 or kindergarten the rest of their life, not a lot of NHL families that can say that. School and everything made it easier for our life." Barry and Kim say much of their life is centered on their family. Within that circle of family is the concentric circle of Nolan, the youngest, who has Down syndrome. "We live in his world," Barry said. Barry volunteers for numerous charities, among them Best Buddies of Tennessee, a non-profit which states as its mission "establishing a global volunteer movement that creates opportunities for one-on-one friendships, integrated employment and leadership development for people with intellectual and developmental disabilities." Kim jokes that her other children will choose their future spouse by "who Nolan picks for them." "Special needs kids, they have such good hearts," Kim Trotz said. "They can tell that immediately about people. (Nolan)'s gone up to total strangers and given them hugs. I'll think, 'OK, this is a good person. Nolan senses it.'" Nolan attends almost all of the Predators' games at Bridgestone Arena and is well known in the building. One difficulty that professional athletes or coaches can run into if they have children with special needs is finding the right schools as they migrate from city to city. Kim said, in that sense, the Trotzes have been lucky to find a supportive school for Nolan. "He has so many friends at school," she said. "We live in walking distance of school. In the mornings, the Grade 5 class gets to help with arrivals, opening car doors, walking or biking, the kids all giving him 'high five.' Everybody knows Nolan. … Being here that long has helped to raise Nolan. Everyone knows him and includes him." Poile and Trotz mostly downplay the idea of the 1,000 games, but Poile realizes that, at least at the outset, the pressures differed from those of a more mature hockey market. Nonetheless, the goal of both men remains to win a Stanley Cup together. "I certainly realize that Nashville, Tennessee, and the pressure that you have here as a hockey market are different than if you're in Montreal or Toronto," Poile said. "I think we've been allowed to operate a little bit differently than I would have to or Barry would have to in a different market." Craig Button said the Predators have what he calls "organizational courage." "The pressures that bear at any given time are sometimes too tough to withstand," he said. "Everyone feels them. David's felt them. Barry's felt them. Why do they do so well? I think they have two things in abundance: Organizational courage and organizational commitment to bigger goals and collectively reaching them. The courage to stay committed to them and carry through during the most difficult times. "It's easy when times are good, not when times are bad. I don't think there's any other franchise in sport that has more of it than the Nashville Predators. … Not very many of them do. It's admirable." Trotz said he thinks another key to longevity is focusing on solutions. "There's times where I go off the rails like anybody else," he said. "For the most part, I try to keep it, 'Hey, this is what we're dealt and this is the situation, so let's make the best of it.' Keep a positive attitude. I enjoy it. I enjoy coming to the rink. I enjoy all the stuff about the game. "Once I don't enjoy it, I think it'll show."